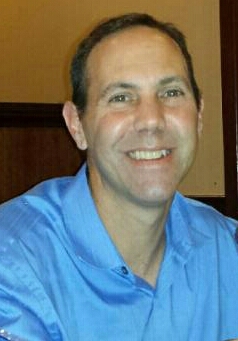 The world lost a real-life Superhero Aug. 16. The Caped Crusader could not defy death, like his TV counterpart did so many times when cornered by The Joker, The Riddler and Penguin, but he gave so much back to life. Leonard B. Robinson of Owings Mills, MD was successful enough in life to indulge in creating an alter ego for himself as Batman. He obtained an authentic Batman suit, pointy Bat ears, Bat mask, Bat cape, Bat emblem, Bat belt and everything, and tricked out a custom-made black Lamborghini Batmobile that looked every bit like the one Batman and Robin drove in the 1960s spoof. 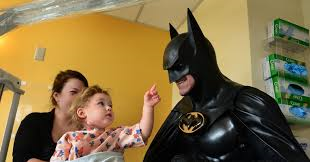 Batman, aka Leonard B. Robinson of Maryland, visits a child in a hospital. But he didn’t turn himself into Batman just for self-indulgent kicks. He used his spot-on costume and props to visit sick children at hospitals in the Washington-Baltimore region and cheer them up, allowing them to forget about their illnesses for a while and meet a character from the big screen in the flesh. Batman Robinson became an Internet sensation in 2012 when he was pulled over on Route 29 in Maryland by police while driving the Batmobile in costume, because of an issue with his license plates, which featured the Batman emblem. Video taken of that police stop went viral. Yet in true Batman character, Robinson’s identity remained unknown publicly until a story in The Washington Post revealed it. I was lucky enough to see Batman Robinson in his Batmobile once in person, on the same Route 29 where he was stopped by police. I take Route 29 to work every day. One day, while riding the bus, I saw the convertible Batmobile with Batman Robinson in full garb driving. It made my day. That guy doesn’t mind standing out in the crowd, I thought. I later learned about his philanthropic mission. Tragically, Robinson was killed on a Western Maryland highway when his Batmobile conked out, and he was struck by another car. He was 51. He will be remembered as someone who put a little personal eccentricity to maximum use for the public good. Just imagine the tremendous impact he had and impression he made on so many kids whose daily visitors are typically doctors, nurses and lab techs. And not only the kids, but their parents and relatives, who no doubt cried with happiness at seeing their kids’ faces light up with joy. Many of us would love to have such influence and make such an impact on others. But how many figure out how to do it like Batman Robinson did? Batman Robinson was an original – no disrespect to Adam West. I feel privileged to have glimpsed the real deal just once. It is a fortunate man who can bring joy to so many while living out a fantasy that could give rise to the thought that, yes, maybe a regular man, like modest millionaire Bruce Wayne, really can have a “superpower” if he is creative and caring and passionate and dedicated. Batman Robinson had a superpower. He will be sorely missed.